PUMA constantly look back to their sports roots to inspire their current Sportstyle collections. In 2018, the global sports brand take cues from the past and moves into the future by completely rebooting the RS design. Going back to zero, stripping the silhouette down to the basics then building it up with a modern aesthetic and technical materials. This ‘0’ starting point turns PUMA’s new RS-0 franchise into a platform: every RS-0 design celebrates the reinvention of a unique moment or movement in culture. Call it future meets retro. The original RS (short for RUNNING SYSTEM) was an innovative, high quality cushioning technology established in the 80’s. The RS was PUMA’s answer to the demand for high-tech stability runners back in the day. Today’s generation recognizes the past and where styles or innovation originate from while constantly moving at the speed of light, pushing culture forward. This subsequent Neo-Nostalgia design trend seeks out something meaningful from the past and makes it new and relevant for today. It offers an inspiring mix of rediscovery and original thinking. Originally released in 1986, the PUMA RS-100 is a running sneaker that was considered extremely advanced for its time. This fashionable and comfortable model has a textile and leather upper, padded collar, PUMA R-SYSTEM technology for cushioning, and a rubber outsole. Shortly after RS-100, the RS Computer Shoe was released. It was the first-ever analytical shoe that gave runners the power of computing to aid in performance. A custom-designed computer chip built into the right heel automatically records the time, distance and calories expended then communicates the results once plugged using a 16-pin cord to any Apple IIE, Commodore 64 of 128 or IBM PC Computer. It was the intelligent way to run and was way ahead of its time. Following the success of the two R-SYSTEM models, the RS-350 was released 1987. The RS-350 is an example of streamlined ‘80s running design, offering support in the midsole as well as rubber details on the heel, definitely an elevated version amongst the R-SYSTEM family. The new RS-0 has undergone a future-retro makeover with a totally new model that lives in the future and yet resembles its past. 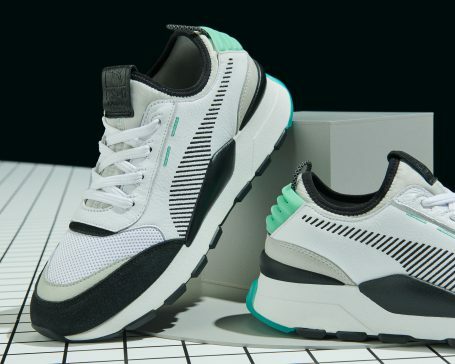 This RS-0 introduction model indicates what “next” means for PUMA and its green colorway is a futuristic take on PUMA’s iconic Archive Green. Starting Spring-Summer ’18, PUMA will kick off its RS stories of reinvention with the RS-0 model followed by modern retro iterations of the RS-100 and RS-350. PUMA has also partnered with influential and creative brands, individuals, and institutions that push culture forward through innovation in design, style, technology, and more. Together they will create drops that explore themes such as gaming, music, photography and more. Watch this space for more on #RS0.